Francis P. Valentine once went to the department's carpentry shop looking for some drawings. There he found one of the most remarkable treasures in the history of building art, a collection of original drawings. The Brooklyn Bridge is one of the oldest roadway bridges in the United States. 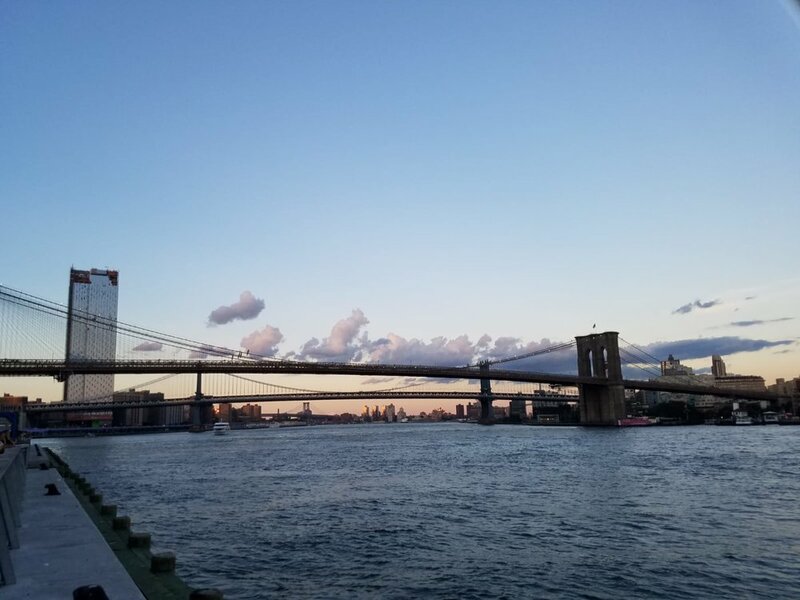 Started in 1869 and completed fourteen years later in 1883, it connects the boroughs of Manhattan and Brooklyn, spanning the East River. It has become an icon of New York City and was designated a National Historic Landmark in 1964 and a National Historic Civil Engineering Landmark in 1972. All those drawings were made by the man who designed the Brooklyn Bridge and the whole collection pertained to the now famous bridge. After a long time someone was interested in the collection so it was installed in an exhibition at the Whitney's downtown gallery. Surprisingly, two other museums wanted to have the collection, too, although some years before when Valentine shopped the collection no-one was interested. The drawings didn't show just the bridge, they showed a log of details as well, for example, the geological strata through which the foundations were dug. Other paintings showed the sailing shop mast's height so it could be evaluated to be sure to pass beneath the bridge. For a long time historians have looked upon the Brooklyn Bridge as a kind of grand but solitary redemptive symbol. From back to front Verena, Monika and me on the famous Brooklyn Bridge. OK, don't get nervous, there's plenty of steel under me. Now they must look also at the drawings and not only at the bridge. PS Here's the start of the next story ... our trip to Niagra Falls. My mother looks like a small innocent little Dutch girl. Don't be fooled. She's a dancing maven, just like the others below. I'll send her dancing diva photos once I get her permission (yes, I'm ever the obedient daughter). TRUST ME, if you're 96.5 and dancing, you're doing JUST FINE! So as I'm trying to work hard at my desk today, my mother (c. 1922) issues a phone call interruptus and then I get a video from my niece Maggie, c. 1989, vocal fry 2012) showing what I was afraid of: the rest of the family has gone mad (Katie, c. 1994, vocal fry 2016). Then see if you don't think these 3 are maybe going to make it on to the stage. Take it away, fam: SHARKIE AND THE 2 VOCAL FRIES: U. Sharkie, M.O. Macleay and K.L. Macleay. SHARKIE AND THE TWO VOCAL FRIES!!!! Where the hell is my sister, Missaroonis? --- AM (Aunt Maggie c. 1953, Chem PhD, VF [Vocal Fry] & TM [Total Meltdown] 1981/2/3, respectively. 1984 - Present, Like JM Barrie, still searching for Neverland. I have been reading a lot. This summary is about the story “The Mysterious Stranger”, written by Mark Twain. It takes place in the Middle Ages in a town in Austria called Eseldorf. The book deals with the story of three boys, Seppi Wohlmeyer, Nikolaus Bauman and Theodor Fischer, narrated from the point of view of the latter. 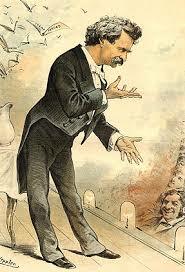 Mark Twain, America's first man of letters and humorist. One day they are sitting in their favorite place in the woods, when a youth strolling comes toward them and starts talking to the boys. He commands magic power and introduces himself as the nephew of the devil. Yes, Mark Twain could talk to anyone. In the first moment the boys are scared of the stranger, whose name is Satan, but he assures them that his uncle is the only one in his family who has ever sinned. As Satan is able to tell a lot of great stories and can apparently do a lot of wonderful things, they stay with him. After his appearance, strange things start to happen in Eseldorf. The priest Father Peter finds a lot of money and an old woman's cat helps her find a fortune. At the time of the story, many people are accused of being witches, and so are some of the people Satan helped. Folks are very suspicious about things they can’t explain. Satan tries to help them, but not all of them. When the boys ask him for his reasons why, he tells them how he thinks about the human race, which is not necessarily consistent or generous. One time Satan tells Theodor that he has to change something in the future for two people, one of them being their good friend Nikolaus. Further he explains his reasons and why he sometimes has to do things that are not good fortune. The occasion Satan changed in Nikolaus’s life was that he should die twelve days later. Satan argued that if he were not to intercede, Nikolaus would have a terrible life. Theodor has to accept this and is only allowed to tell Seppi. Together they spend their time with Nikolaus on his last days, but with a bad feeling. After NIkolaus's funeral some more things happen, leading back to Satan’s work. Satan makes himself unpopular with the people, often laughing about the stuff humans do. "What are the folks up to now?" With other things he seems to help the people, but often those things are not so obviously his work. After a while his visits to Theodor get more and more infrequent, as Satan "has a lot to do in other universes." One day he sees Theodor and is off forever. To me personally The book Tao Te Ching makes a very plain first impression. As I got into reading the first few chapters, the main focus of the book seemed to be the art of living, which the author writes about in a meditative, didactic way. At this point I asked myself, if by "Man" he meant the entire human species? To me Homo sapiens aren’t such a great species, because its mainly makes bad contributions to earth and nature are often deleterious. I personally wouldn‘t mention the human as one of four great powers. Other species on earth are more elegant and less destructive. But maybe it was important to the author because this book gives advice on how to live your life as a human being and how to make the best of it. In one poem Mitchell describes the "Tao" as an invisible power, which flows through everything and cannot be compared to anything material. It reminds me of a person religious people call “God", since it has existed even before the creation of the universe. But other than God you can't define the Tao so well. Everyone imagines it in a different way; some people might think of it as a ghost-like creature, others think of it as a cross or a rainbow. The positive thing about the Tao is, that people of all religions and secularism can get advice from it regardless of race, gender, sexuality or religious beliefs. In conclusion, anyone can learn something from this book to improve their way of living or their way of thinking about certain topics. And the way a person thinks about something affects their way of acting and can result in different consequences. I started reading through the collections of Langston Hughes poems at night. At the start I didn't know that the loneliness of the night is matched in his poems. The book "Selected Poems of Langston Hughes" is a collection of poems which were chosen by Langston Hughes himself. 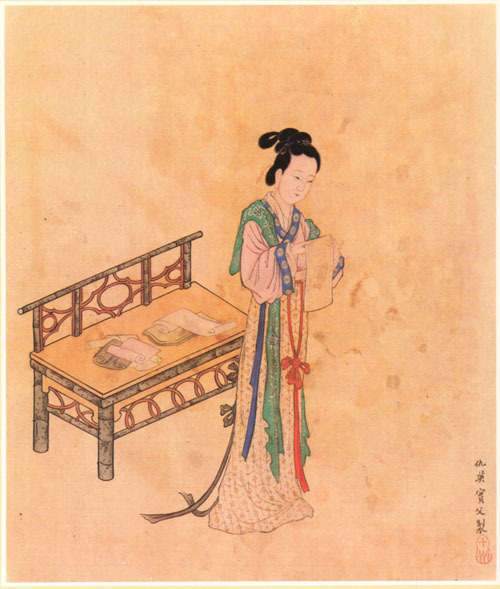 The Collection of Poetry is divided into 13 chapters. Each chapter is about a special topic. The first chapter is about African Americans. The poems in this chapter are mostly about slavery, poor working conditions, and dreams of being free and enjoying life. I think Mr. Highes chose this topic for the first chapter because it is an underlying and ongoing issue for all African Americans in America. Period. The second chapter is about Jesus and praying. The topic of the second chapter is purposeful, answering affirmatively to the first chapter - with the hope that many African Americans and many other people find through religion. 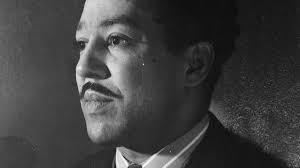 Yet in the chimera of hope, Langston Hughes’s poems are melancholic and sad. He writes about people, mostly black people, working and living in adverse conditions. His love poems are about heartbreak, loneliness or lovesickness, but ultimately about love. Almost every poem also includes a spontaneous wish for hope, the hope that shines in all of us, that hope that everything is going to be better. Someday. Today our students are in Ocean City with David and Chris, soaking up sun on one of those rare summer days this year when rain was predicted but just didn't happen. We hired two brick layers so Jubilee is not so lonely. Here is a video taken by Klara in Georgia. As Monika described, we moved from a temperate climate to a tropical climate. Our interns were just finishing a massive 2 day project, pruning Formosa Azaleas 5 meters high and removing wisteria and greenbriar vines, old wood and debris that had collected for 40+ years or as long as anyone can remember. Here they are pulling away a particularly difficult vine, just as the rain came pouring down on to the live oaks, magnolias, and our seemingly small but intrepid landscape managers. Even inside, trees are hard to miss and always nose in on the scenery. Jana and Klara reading in the library at the Reid House Farm. Yes, Georgia is the land of tall and magical trees. Here is a lovely footage of my favorite recording artist Eva Cassidy --- Tall Trees in Georgia. Her parents were from Georgia. "Fields of Gold" and "Over the Rainbow" are also my favorites from 1996. The Washington Post commented that year that "she could sing anything — folk, blues, pop, jazz, R&B, gospel — and make it sound like it was the only music that mattered." She died the same year from metastatic melanoma, aged 33. These recordings of Fields of Gold and Over the Rainbow, as well as Tall Trees in Georgia, are from one of her last performances at Blues Alley, Georgetown, earlier in the same year. Tall trees in Georgia. They grow so high, they shade me so. I'm sadly walking through the thicket I go. Because I did not want to be any man's bride. My parents took me where ever I traveled out. I traveled west and north and east and south. I found my sweetheart, he would not marry me. But now I'm older and they're all settled down. For if you're fickle you'll soon be left alone. For if you love all men you'll sure be left with none. We'd soon grow tired and go off alone again. Here it is again from the Native American (Canadian) woman who wrote the music and the lyrics, Buffy Sainte-Marie. Buffy Sainte-Marie was born in 1941 on the Piapot Plains Cree First Nation Reserve in the Qu'Appelle Valley, Saskatchewan, Canada. She was adopted, growing up in Massachusetts, with parents Albert and Winifred Sainte-Marie, a Wakefield, Massachusetts couple of Mi’kmaq descent. How to Become an Expert Gardener in a Tropical Climate. Get up Early and Eat a Big Breakfast! We are back in Maryland after a week in Georgia and Florida. We were staying in a big, beautiful house, with a big garden. The area is very impressive, and the garden is really magical. 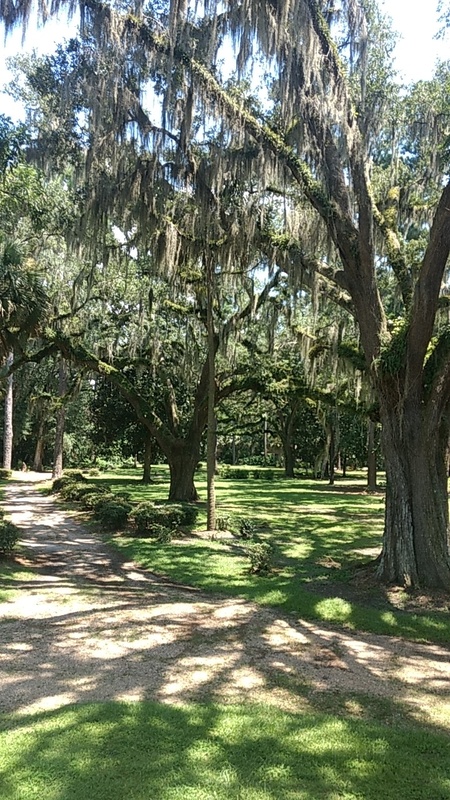 There is a lot of Spanish moss hanging down from the trees which leads to, in combination with the palm and magnolia trees, a fairytale mood. Sunlight in the trees at the Reid House Farm. But the highlight is when the sun is rising in the morning and the light glows in the trees. And in the evening it is possible to see some owls. Morning sunlight in the palm and live oak trees. A big garden needs a lot of care and so it was our work place for our week in Florida and Georgia. Before we were able to start work each day, it was really necessary to have a good breakfast, to have enough force for the work. Also it was really important to use mosquito spray. The kitchen at the Reid House Farm. 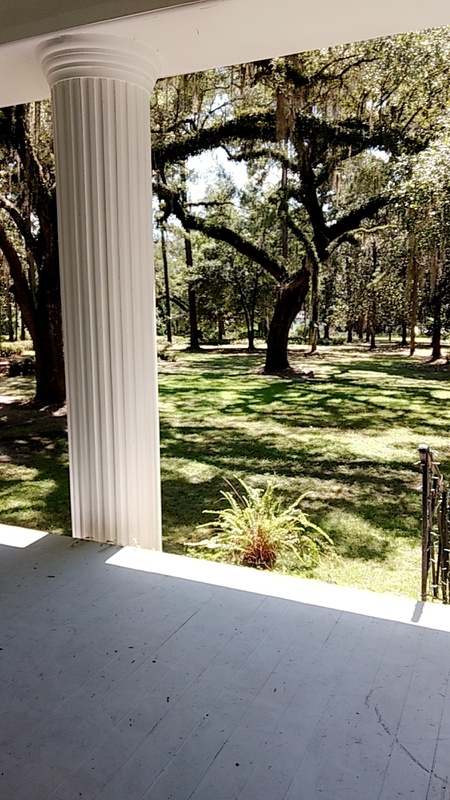 Getting ready to head out to the gardens from the porch. Bits of dirt from the previous day. When we finished, we also cleaned the porch and Maggie was extremely pleased. In the first days Jana and Klara cut some bushes and Lisa and Tina cleaned a secondary area of azaleas in the arrival area. The rest of us started in to new territory where azaleas hadn't been cut down for 40 years. We cut down 5 meter Formosa Azalea bushes to 1/3 meter. This was a lot of work, because there were a lot of vines with thorns. That’s how we got one or another of the cuts on our legs, but with the teamwork of all together (including Maggie) we were able to finish our work in the beautiful garden. Here is where I started with Verena and Elisabeth. Behind me and in front of Verena you can see the shrubs really are 5 meters. Our work started early in the morning, because in the afternoon it got quite hot and humid so that it was impossible to work effectively. We were surprised how much landscape we cleared and improved. Now there is a big heap of debris in front of the garden which will be removed by the town next week. Here is Elisabeth hauling wisteria vines that were choking the camelias. Verena with a big pile of vines. Verena and I are raking the final debris from the first clump. Tina and Lisa starting in to the second large clump of Formosa Azaleas. There is still a lot to do but in the future the Reid House Farm will also be a place for weddings. On Friday we went to the Sunshine State -- Florida. After 2 hours driving, we arrived at the beautiful white sand beach on St. George Island. There we spent some hours in the sun swimming and relaxing. Enjoying the sun at St. George Island. After that we went to Carrabelle where our apartment was located. First it was a little bit difficult for us to find the right place. We had dinner at a quite trashy restaurant. But the food there was tasteful and we met some nice women who were a little bit crazy. On the way home we saw the world's smallest police station. On the second day of our trip we went to a town named Apalachicola. It was a little bit rainy in the morning but nevertheless we enjoyed shopping there and eating lunch at a very nice place where we had a great view of the water. In the afternoon we went to the beach again. The sun was shining very strongly so we all got a great tan. We stayed there nearly until nine o' clock to see the sunset. On Sunday we headed back to Thomasville but stopped at the Governor's Square which is located in Tallahassee. Finally we were able to go to the famous Victoria's Secret store. After shopping in such a big mall we went to our favorite store -- Marshalls. Now we can look back to a great trip to Florida, where we spent a nice time although some of us got a sunburn. Here you can see the sunset at Carrabelle. So Much to Do! So Little Time! 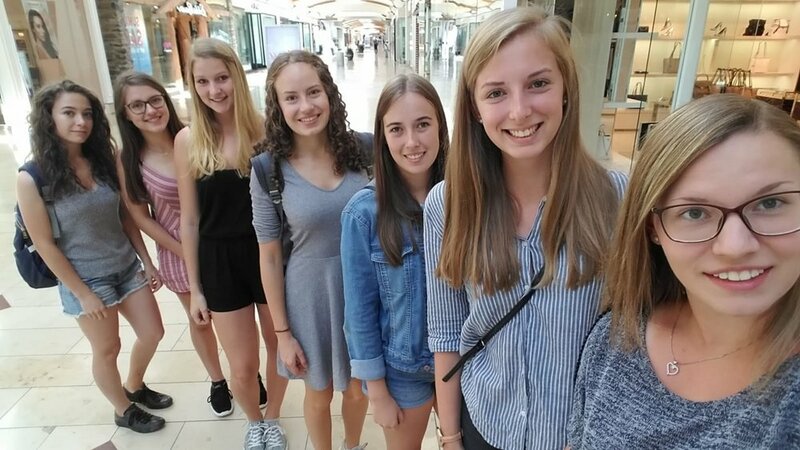 On Sunday we went to the movies to see Mamma Mia! — Here we go again. When we arrived at the cinema, we were a little bit confused at first as we couldn’t answer a question we were asked by one of the workers there. He soon realised that we must be from another country as we didn’t know how the system in this cinema works, so he explained it to us. Further, we bought Nachos, mozarella sticks and popcorn to have some food during the film, so we didn‘t have to starve. When we went to the room where they played our movie, we were very surprised by the chairs there! You could move them to nearly a sleeping position — very relaxing. In Austria we don’t have such luxurious seats, not even in the VIP area! The only bad thing was that it was quite cold in there. Before the movie started, they played a lot of commercials and trailers. The movie was very nice to watch and we all enjoyed it a lot. We didn‘t have any problems with understanding what the actors were saying, either. What a nice way to spend a Sunday afternoon! We are able to try a lot of new things here. Last week Maggie tought us how to do wallpapering. In the beginning she showed us places in the house where wallpapering already has been done and told us about the techniques used and some of the difficulties they in certain areas. Tina and Lisa are hanging a piece into a corner (tricky!) while Monika is preparing to cut another section. Further, she showed us how to identify a good quality wallpaper and which pattern she likes. After this short introduction we got started. Maggie showed us how to mix the glue for the wallpaper for adhering it to the wall, and how to measure and cut the roll. She helped us try our first pieces on the wall on our own, but we always had to help together in pairs or groups of three, because it was a little bit difficult to keep the wallpaper on the wall and assure there are no wrinkles. We didn’t have enough time to finish the whole room but enough that we could already see a huge difference! Some of us are already thinking about continuing with wallpapering at home, too. Hopefully our moms are as happy about that as we are..
Elizabeth and I are working together on the window edging. Yesterday we had to get up very early in the morning — at 5am! The reason why? We drove to Georgia by car, which is an extremely long car ride! Because of that we had to start early. On our way to Jubilee farm, where we met with Jim and Maggie, the man on the radio was saying "What a Monday!". We agree. We spent all day sitting in the car listening to podcasts, music or talking to Jim. Jim told us, especially me as I was sitting in the front seat, a lot of stories about the cities we passed, occasions which had happened in his life, things he thinks are good to know about the American highways and a lot more. And I have to say, I really learned some new things! Furthermore, I sometimes had to be Jim‘s secretary as he often got some text messages he couldn‘t answer while driving, so I read them to him and he responded at our breaks. We stopped for little breaks to go to the restrooms, walk a little bit, use the phon, or eat something. We also stopped at "South of the Border" so we could see this very strange place. We saw some other strange things, too. For example when we stopped for dinner, we saw a motorcycle with a coffin on it! As it got later and later we got very tired and were looking forward to our beds. When we arrived at about 11:30pm, we were so surprised by the beautiful house we had to look at all the rooms because they looked so great! Tuesday we were in Annapolis, a really beautiful town near Washington, D.C. My job was not just to enjoy but also to drive the car. Yes, that sounds very easy, but for Monika and me this was difficult and a bit stressful. Monika´s part was to drive us to the big shopping mall in Annapolis. We had a GPS and a map with information from Maggie with us, luckily. Because without them we would maybe be in Washington, D.C. or somewhere else. After two hours driving we were at the mall. All of us were really curious about the different shops. We found some great new clothes and the food was also very delicious. Then I had to prove my driving skills, because our next destination was the city of Annapolis. It was really difficult driving even with the GPS to find the right way, but luckily my navigator Verena could find the correct way. I have to mention Verena was the best navigator I ever had. In Annapolis there are a lot of cars and the streets are really narrow. We found a parking lot at the harbour and we decided to eat ice cream. During the break I calmed down. The hardest part was to leave the city and to find the right way to the highway. I drove along streets with five lanes, a big highway beyond what I've driven before. I had to concentrate the whole time and that was very exhausting. I am not used to driving a big car like Maggie and Jim's Dodge Caravan. In general the cars in the USA are bigger than the cars in Austria and some people drive really fast. I am now a better driver and I expect the roads in Austria will no longer be a problem for me. It was a great experience but I was really happy and relieved to be at Woodlawn again. PS Maybe I will write again about my encounter with a wasp after working in the vineyard Thursday! Hey, there! 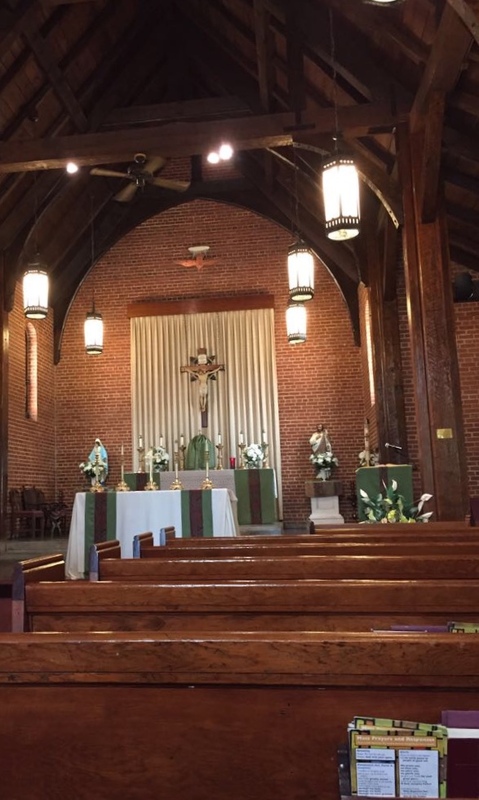 Last Sunday we were privileged to experience a service in the St. Peter Claver Church. We went there because we were curious about the differences between Austrian and American churches. And we have to say, we were absolutely surprised, but in a positive way! As this church is an African Catholic Church, there was a gospel choir. With their stunning songs they made the service very lively. So did the priest, who told some jokes during the sermon. The people there were very friendly and conveyed to us a warm and hearty welcome. It was definitely a good decision to go there! Hey, my name is Verena and I’m one of the seven Austrian trainees this year. This is my second practical training in a foreign country. 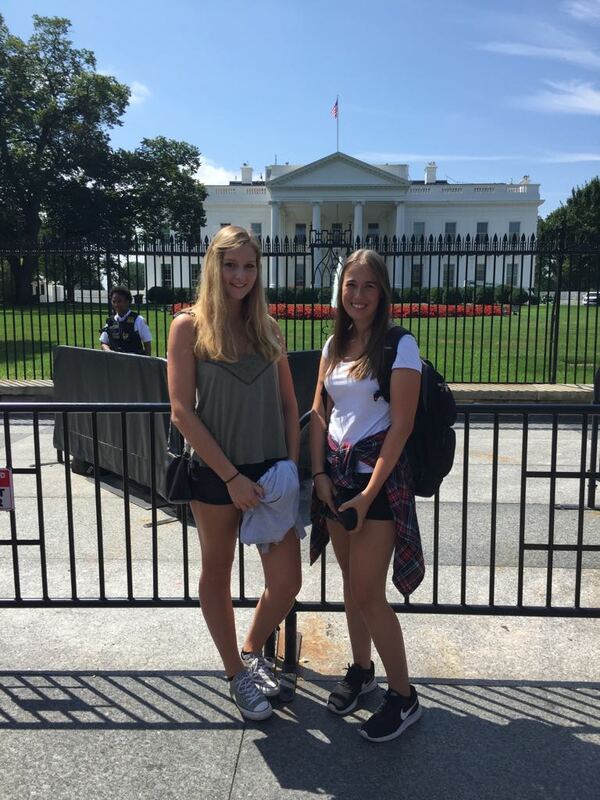 Last year I interned in Sweden for fourteen weeks, together with Elisabeth. We were at a dairy farm with about 200 diary cows, a lot of calves and many heifers. Our tasks included milking the cows and caring for calves, including feeding them and refreshing their boxes. The calves were extremely cute and funny, as well as curious and a little bit clumsy. A cute little calf and me. We cleaned the cowshed regularly, put the heifers out to new pastures, did gardening work as well as construction work as the family was building a new barn during the time we were in residence. On occasion we cooked Austrian dishes for the family we lived with or baked cakes for our co-workers, who seemed to be addicted to sweets. But our main duties were outside in the barn. 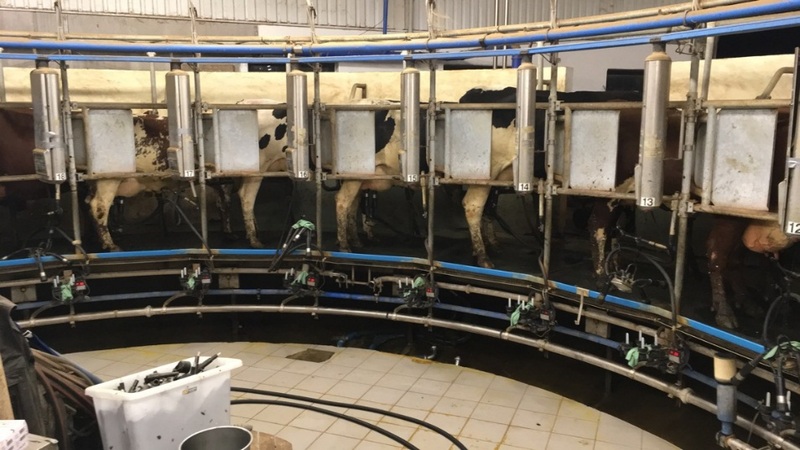 The cows were milked three times a day, once in the morning, once in the evening and once in the middle of the day. For the milking in the morning we had to get up very early at about 4am --- which was pretty hard in the beginning as you might imagine, but we got used to it. At the end of our practical training we were quite good at milking cows and completed our work faster, too. In general, we had to work a lot which was often extremely exhausting, but we also gained many new skills and learned a lot – not only about farming but also about the country and the people. 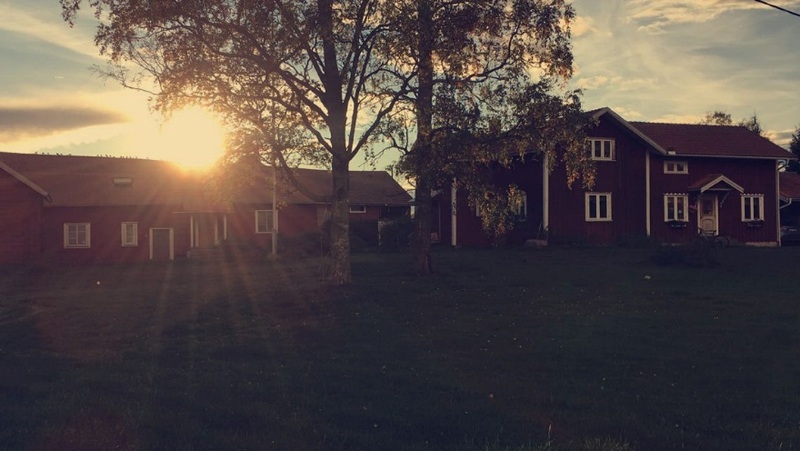 Our leisure time was spent either outside in the beautiful Swedish countryside or visiting cities like Stockholm or Göteborg. It was an amazing time there, which I talk about often because I really enjoyed it, even though the farm schedule was grueling. I love to create beautiful memories as I did there. This is the reason I’m very grateful to be here in Maryland now. And I’m already very curious about the work in the vineyard and everything else we will do here. I´m really looking forward to the next 4 weeks and hope to see many new things and places, get new skills and learn as much as I did on my last internship. The Flight to Dulles International Airport... seems a long time ago. Hi there, we are Lisa and Tina! We started our trip to America at eight o´clock from Upper Austria. First we drove to the airport at Munich. It takes three hours. When we arrived at the airport we checked in. After four hours sitting in the plane we were in Reykjavik, Iceland. At Reykjavik we were a little bit stressed because there were a lot of people and we couldn't easily locate our gate. Luckily there were many friendly and helpful people who showed us to the gate. After the chaotic search we sat happily in the Icelandair plane and flew straight ahead to Washington, DC, Dulles Airport, for six hours. We were happy that we arrived without any complications and lucky our baggage arrived, too. Jim picked us up at the international gate and brought us to Woodlawn. The time in the car with Jim passed quickly because we talked about God and the world. Our first impression of the farms was very positive and we are curious about the four weeks at Maggie, Jim and Tucker's place. We woke up early in the morning with jet lag on the one hand and excitement on the other. With the first step out of the door, we were surprised by the high morning temperature. But we didn't think it could get much hotter. When we arrived at Jubilee Farm, the sister farm to our residence at Woodlawn, our task was to weed the extensive gardens. In the beginning, as with all ventures, it went well; the sun rose as did our effort. At our first break, a very tasty, cold and refreshing beverage was served --- iced tea. Delicious. Klara pulling weeds, more weeds, and more weeds. The expression "many hands make light work" is clearly not just a saying. We've experienced the result of work and reward. And what was our reward for our amazing work --- weeding 1/2 acre of gardens in one day? We got to go kayaking. Maggie showed us how to kayak through Blake Creek and back to the head waters. She guided us through the still waters until we arrived at the beaver huts. The beavers were too shy to show themselves, but we saw a Terrapin turtle and several herons. Jana is on the left; Lisa Neundlinger is on the right. This is a Maryland Terrapin, an endangered turtle species. He is sunning on a beaver log. Amazingly, we didn't even capsize. All in all, it was a great first day of work and we are excited about many more experiences to come. and each of us have responded with a response from our readings. The Library at Woodlawn was the source for our books and I chose a book about the Cottage Gardens. We have been working today to restructure the "cottage gardens" at Jubilee Farm. The pictures below say it all: love the plants you work with and don't be afraid to shape them and the landscape they inhabit. Here I am with Tina reshaping the eponymous by the pool. In my readings I learned that the Cottage Garden has a rural charm and can be used in town, city or country. Its ambience looks like an orderly chaos unplanned and overgrown; you will need to shape it if you like order (see pictures below). You have in the cottage garden more different types of flowers than in a conventional garden. Colors are mixed and many cottage gardens consider water in the form of pumps or ponds. Here is the euonymous Tina and I pruned. Flowers are at the front of cottage gardens and vegetables, too, if you know how to incorporate them. Traditional cottage gardens have wild and fruiting trees; whatever you love in the garden, structure it so you get many different effects with the plants you love. For example, structure areas for tall plants, formal hedges, rustic fencing, climbers or fruit trees. A garden is so much more interesting to walk around if it has a theme. A traditional cottage garden feature is to use edging materials to outline paths with low-growing plants to invite you in to an area. Arches, garden seats, arbours, gravel or brick paths give the garden a typically rural deal. Arches are ideal features for linking different parts of the garden, and different sorts of climbing plants like roses and clematis look pretty over an arch. Seats situated at the end of a walk, or in a niche in the hedge also look enticing and beautiful. Today we also painted the front stoop of the Jubilee Farm house. This is where our friends, Maggie O'Brien and Jim Grube, live. We repaired the wood steps, leveled them, reset them into the brick walkway, and here we are finishing the painting with a few patches to go.